All this week we are volunteering with the charity CCS – Community Concern Society. 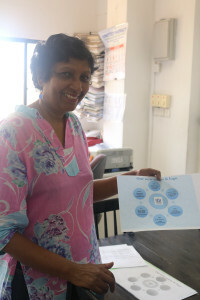 As Nirmala is explaining in the photo below, the charity has been going for over 30 years and has grown to cover many different ministries over the years. Nirmala has arranged different things for us to do each day; so that we will have a good overview of CC by the end of the week. On Monday Emily and the girls helped with ‘Heavana’ (a refuge of mostly single mums who are victims of domestic abuse) and John spent the day 28 kms south of the city at the ‘Power House’ (a drug rehabiliation centre for men). Today we all helped at the pre-school and day care centre. 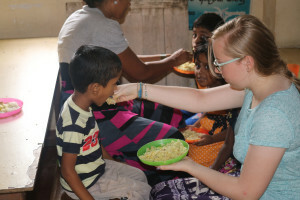 The girls helped with some classes for the children and we all served lunch – literally into the mouth on occasions! It would take too long to recount the many stories about CC, so I will try to give an overview in the next few days. CC is based in Dehiwela, next to the sea, just to the south of the city. Although CC had been going long before it happened, the Tsunami (Boxing Day 2004) brings a lot of their work into focus. CC has always worked with those who live on and near the beach in Dehiwela. When the Tsunami struck they were fortunate that (as far as they know) no one died there (although so many died further south). However, many lost their homes and CC worked hard with other aid agencies to build new housing and to care for this devasted community. Their ministry includes education (catch up schooling for those who have missed out so that they can enter main stream education), child care (so that mothers can work to support their families, especially if their husbands are alcoholics or addicted to drugs), salvage work (creating employment by enabling people to make things out of refuse, drug rehabilitation, medical care and housing – they have worked particularly hard to house people who are not accepted by the mainstream Singhala society, e.g. Gypsies. I’ll make some further reflections on CC later, but my first impressions have been of ‘integration’. Their programmes are so well integrated at every level: 1. Coordination – they have thought hard about entry and exit plus the integration of programmes. For example, if drugs are destroying the community they are working with the men who are addicts, their wives who bear the brunt, and the children who grow up in the situation; likewise they don’t just send people out from programmes but train them for and faciliate the next step. 2. Holisitically spiritually – CC care for the whole person. They are not ashamed of their Christian convictions and many aspects have spiritual input. However, this is not just an evangelism factory – they work with all people in the area (regardless of religion and background) and care for their physical, emotional and spiritual needs.